a villain (as was often the case), William S. Hart created a film style that revealed an authentic vision of the Old West. He made a major contribution to film history by developing and embodying the prototype of the frontier hero. Fame, artistic recognition, and wealth were Hart's rewards. In 1888 he began to study acting. In 1899 he created the role of Messala in "Ben-Hur", and he received excellent reviews for his lead part in The Virginian (1907). His first film was a 2-reeler, His Hour of Manhood (1914). In 1915 he signed a contract with Thomas Ince and joined Ince's Triangle Film Company. Two years later he followed Ince to Famous Players-Laskey and received a very lucrative contract from Adolph Zukor. His career began to dwindle in the early twenties due to the publicity surrounding a dismissed paternity suit. 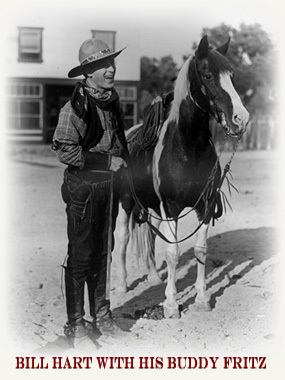 He made his last film, Tumbleweeds (1925) for United Artists and retired to a ranch in Newhall, CA. True to the spirit of Western heroes he had portrayed on screen, Hart was humbly grateful to the fans that had supported his film career. Filmography (film·og·ra·phy) - A comprehensive list of movies in a particular category, as of those by a given director, actor/actress, or in a specific genre.